Hello everyone, and a warm welcome to you. At least there's some sunshine in today's pictures - the fact that my fingers nearly froze while I was photographing, we'll overlook for now! So I'm still catching up with The Funkie Junkie's 12 Tags of Christmas (only not Christmas if you're me)... but I'm getting there, and in all we've got until 17th December, so I should make it, I hope! 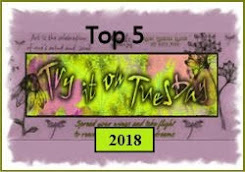 From Linda's original tag, you can spin off in any direction, as long as you let her know what it was in her tag that inspired you. And the prize, if you complete all 12 according to the rules, is sponsored by The Funkie Junkie Boutique. 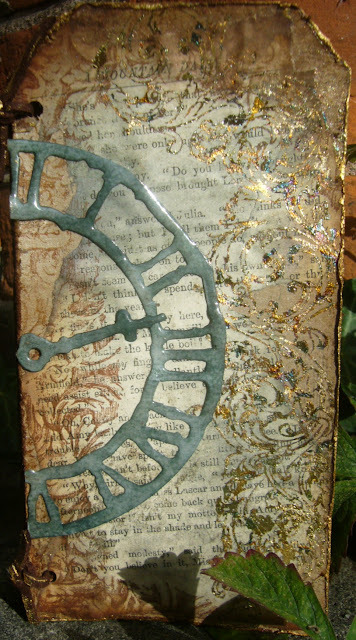 So for this one, it's obviously the gloriously glossy clock die, and the magical book text background. I've been using book pages as backgrounds, and love them, but Linda's added an extra refinement - ripping some of the print away with masking tape - which I completely love for how it adds to the distressed look. Expect to see more of this one! I was also inspired by her use of Iced Spruce DI, which I've only just added to my stash, and once I'd started using it I couldn't stop. 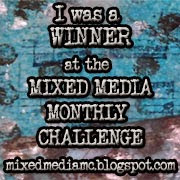 So as well as using it on the background, as Linda did, mine also made its way onto the clock! This was one of those projects which just kept expanding by itself. It took several days, and quite a few times of letting it wait and see. 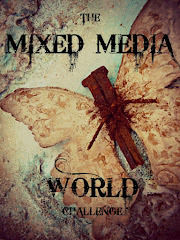 But now this tag has hidden secrets to reveal... Let me take you on a journey in search of illumination. Something in the distressed book text and Iced Spruce made me think of those extraordinary medieval illuminated manuscripts, and I started to try to capture something of that quality. This is the cover of my book, worn, leathery, but still carrying that golden gleam of knowledge and painstaking labour. The first step was to try out the Indigoblu Mega-Flakes I added to my stash a while ago, but hadn't dared play with yet. I wish I hadn't waited so long - I love them! They're used here with the Tim Holtz elegant flourish stamp, and I adore the shimmer of the peacock metallic colours in the light. And because it has the shifting colours, it keeps that sense of age and distressing - it's not "perfect" gold leaf, but shifts as the eye looks at it. I love that in this particular selection of flakes, there's a turquoise-y colour, which I love with the Iced Spruce UTEE'd clock face. You can see that around the distressed edges of the tag, I added some gold acrylic paint using my fingertip - looking for that medieval gold edged paper feeling. If I had been a monk in the Middle Ages (sorry, I'd really rather be a monk than a nun; I prefer the singing), I very much hope that I would have been one of those lucky ones in the Scriptorium, charged with copying the best knowledge of the age from book to book, disseminating learning. 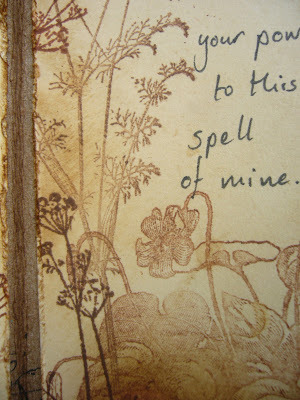 I know that in writing about my book of spells, I traduced the church for its actions against "witches", and the wilful destruction of so much wisdom and knowledge of the natural world, but there is also much to be grateful for in the music, architecture and libraries created in the name of religion. I was so lucky that the sun shone briefly today - there's so much gold shimmer around that it would have been impossible in the recent dull days to get a photograph that would even slightly do it justice. The flourish here on the lower panels is stamped in Versamark Watermark ink, and I then brushed gold and copper mica powder into it for the burnished sheen. The whole panel has had a light dusting - I hope you can see the lustre. The quote is one I've always loved... and it's just the start of the piece. I had the whole of the Desiderata up on my wall throughout my university years. I could probably do with hanging it up again now. Or maybe I'll just open up my illuminated tagbook. The quote is handwritten on some more of my tea-stained tags, and distressed with Heirloom Gold Perfect Pearls Mist (which I painted on in places as well as spritzing), Gathered Twigs DI, and some more gold acrylic paint on the edges. The corner stamp is by BoBunny. There's plenty of Heirloom Gold misted around, inside and out! 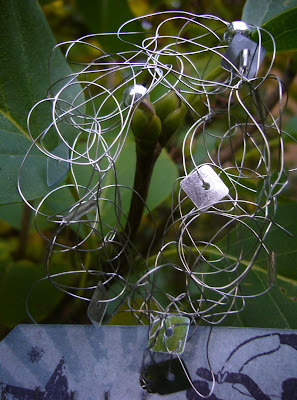 I had a lovely time creating my illuminations. They are embossed in copper, and then painted using Tim Holtz's Perfect Pearls paint technique. The shimmer is so glorious - again, thank you Universe for the sunlight today! I even think they're beautiful before they get anywhere near the paper! I don't have one of the official palettes, so I used some leftover Idea-ology packaging from a set of gears (I never throw anything away at the moment). Once you've made up the paste, you let it dry, but it can be reactivated any time with a brush and water - so pretty! Thank you so much for bearing with me through this search for illumination - I hope you've found some inspiration, or simply some pleasure along the way. It's certainly a joy for me to know that I'm not on this journey alone... I'm so grateful for your company and your support - thank you! I don't want to make this post even longer than it already is by quoting the whole of the Desiderata, but if you don't know it I do urge you to follow the link - it's very beautiful. And I'll leave you with just a few more phrases from it which I love. You have the right to be here. ... in the noisy confusion of life, keep peace with your soul. 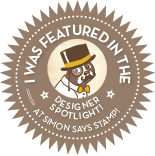 Simon Says Stamp and Show would like to us to Just Add Pearl - plenty of Perfect Pearls here! Hello all, and welcome! Thanks so much for taking the time to stop by. 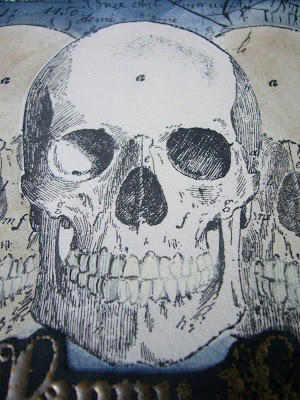 I'm so in love with this skull stamp from Tim Holtz's Apothecary set... I think without it I probably wouldn't have gone Halloween-y at all. And now I'm on at least my fifth project influenced by All Hallows Eve (here, here, here and here, if you've time to spare, and curiosity enough to kill a cat...), and he's on three out of the five, and clearly on overtime in this one! There are a number of Halloween themes around at the moment, of course, but the challenge over at Our Creative Corner is specifically looking for Halloween with the use of masking technique. I love to mask, as you'll have seen if you visited the first 'here', so I didn't need telling twice. I love the 3D effect you get of one image sitting behind another, and I love that you can get those extreme colour differences, right up to the image, which gives it such definition. So the central skull went in place first, and I used the mask I'd already cut for him - out of an old book page. The paper is quite thin without being completely flimsy, which makes for a good mask. If your mask is on thicker paper or card, you won't be able to get the image to stamp as close to your first, as there'll be gap where it has to deal with the thickness of the paper. However, if it's on something too thin and frail, you won't be able to do the blending without it creasing up or ripping. Bit of a Goldilocks situation - but I find the book page is "just right". Next to be stamped were the skulls either side of the central image and then, using the same mask, the spiders' webs (Tattered Angels) and writing (TH Apothecary - my new favourite script stamp!) behind them. All of that was stamped in Black Archival ink, since I knew I'd want to do some blending, and who knows what else, and wanted the images to keep their integrity. Then I did my colouring of the two secondary skulls, Pumice Stone DI on a blending tool, done quite roughly - not looking for perfect precision. 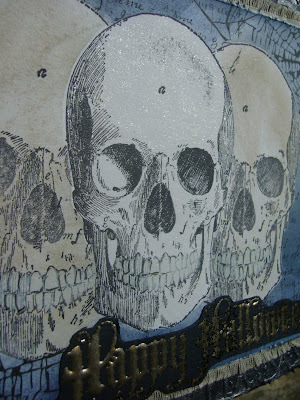 Then it had to be Chipped Sapphire to give me my moonlit night behind the skulls. The Happy Halloween (also TH Apothecary) is embossed in Frantage Aged Silver enamel onto dark blue card. 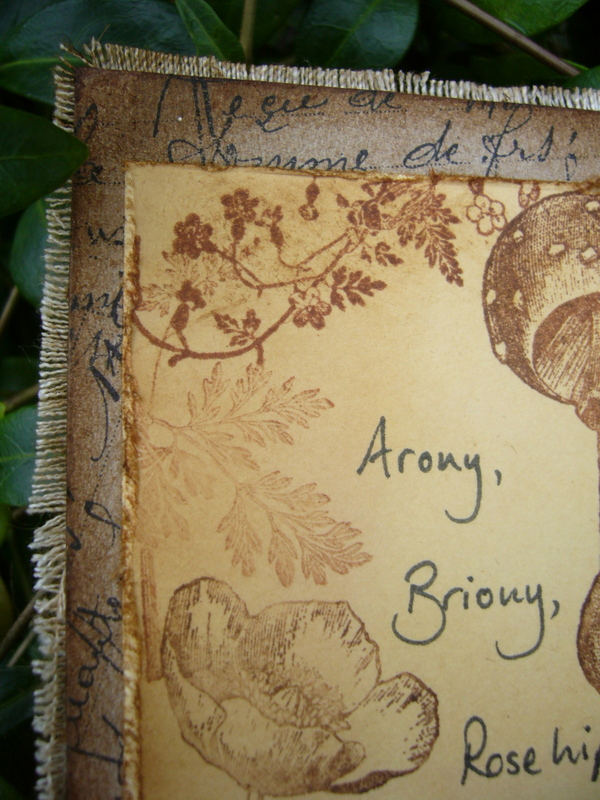 The same card is used as the background to the plaque, embossed with the Cracked Texture TH embossing folder (always looks a bit cobwebby to me). I applied some Pewter Metallic Distress stain to the raised areas for the sheen and lustre of it. 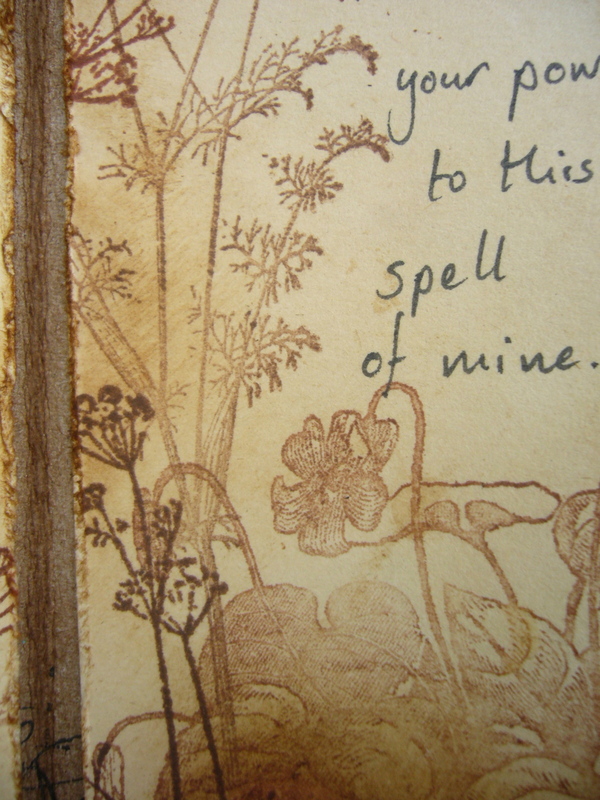 Between my inked card and the embossed background, there's a layer of calico, frayed at the edges... I loved how it picked up the colour of the Pumice Stoned skulls so exactly, as well as offering some lovely additional texture. I was lucky enough to have Mr Random Generator pick my comment out of the hat over at Snazzy's last month, and the spider comes out of the TH Idea-ology Halloween set that arrived a couple of days ago to put a big smile on my face. He timed his arrival perfectly and looks rather splendid, I think, with a little coat of Pewter Metallic Distress Stain! Hold on, man. We don't go anywhere with "scary," "spooky," "haunted," or "forbidden" in the title. Hello all, and welcome to Words and Pictures, with an especially big welcome to the new followers... it's great to have your company on the journey. I'm sharing some white witchery today - a different angle on the denizens of Halloween - the pocket book of a herbalist, or gatherer of simples. Who knows how much natural wisdom and knowledge of the healing powers of plants was lost in the culling of so-called 'witches', as the Church sought to eliminate the influence of the wise women? 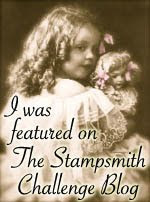 The cover is made of calico, stuck onto thick chipboard, stamped with a Tattered Angels flourish, and frayed at the edges. 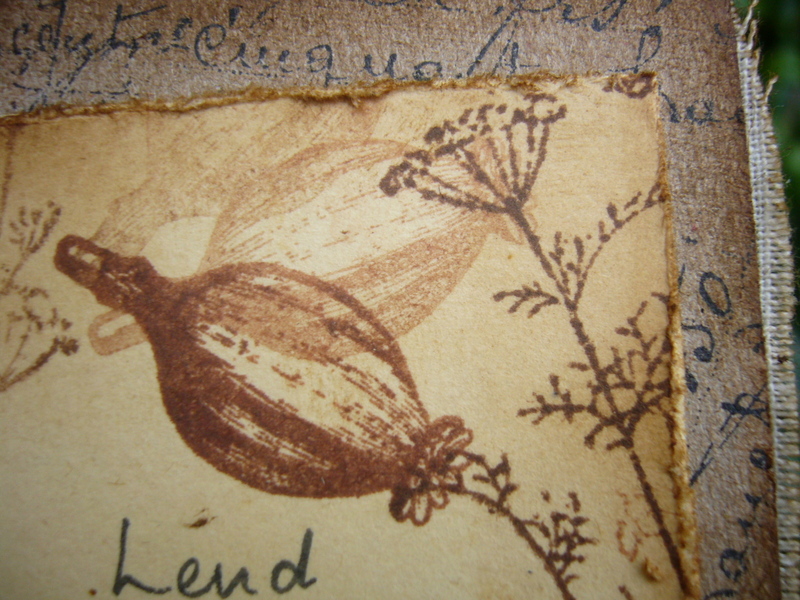 It's been aged with blendings of Antique Linen, Vintage Photo and Gathered Twigs Distress Inks. 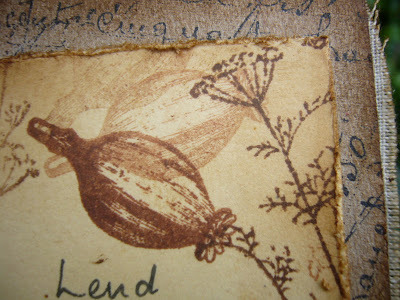 The twine has also had some weathering with Vintage Photo and Walnut Stain Distress Stains. Lovely, messy job, swirling it around in the ink on the craft mat! The label has been stamped with some more Tattered Angels flowers - I thought the one on the left was deliciously medieval - and then hand-written (ooer - the handwriting is back, and for the first time I don't hate it!). It's made from one of my tea-stained tags... 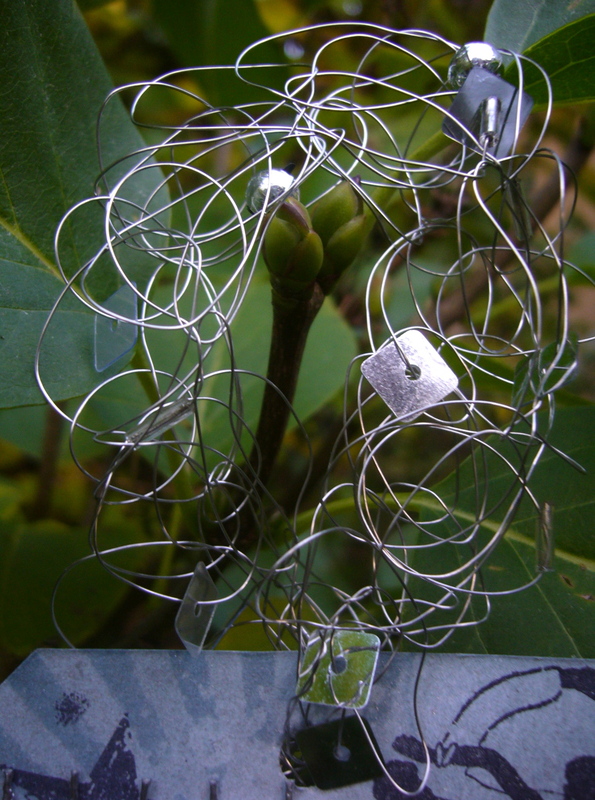 If you saw What was On My Workdesk this Wednesday, you'll have seen all the experimentation. 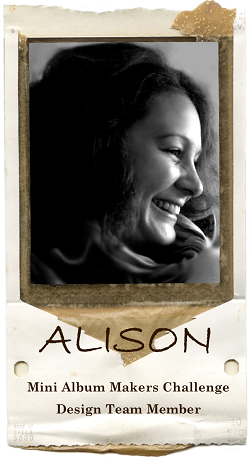 I was inspired to give this a go by the wonderful work of Lynne over at Adorn. 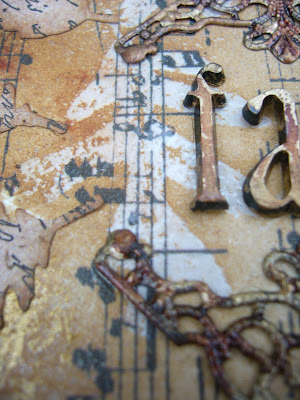 She creates beautiful vintage pieces using tea and coffee stained elements. I've used some more of the tags for the inside too. When I said, on Wednesday, that all the tea and coffee soaking reminded me of a school project, I wasn't joking. It's one that I remember incredibly clearly (even though it must be nearly 35 years ago! ): we had to create a witch's spell, and were told that we could age our paper by soaking it overnight in the afore-mentioned drinks. 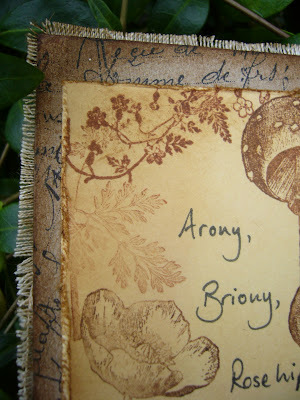 I still remember the refrain from the spell I wrote: Arony, Briony, Rosehip, Thyme, Lend your power to this spell of mine... and that was really the spark for this little pocket-book. It seemed only right to use some of the tags to revisit that phrase! 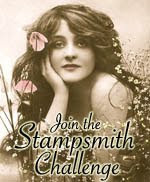 And I now have the most beautiful stamps to do the work for me - instead of my own hand-drawn efforts at decoration. These are mainly a mixture of the Oxford Impressions set Dr Coffin's Apothecary, and Artemio's Hedgerow Plants... and again with the handwriting! 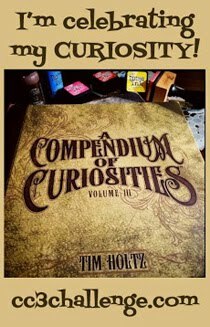 In the background there's the absolutely gorgeous script from Tim Holtz's Apothecary set... now that's what I'd like my handwriting to look like! 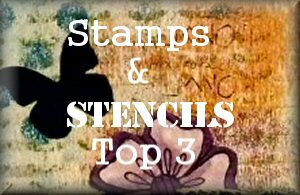 I was playing with Tim Holtz's glorious stamping techniques (which you can see him demonstrating here), in terms of applying the ink to the stamps differently for different effects. 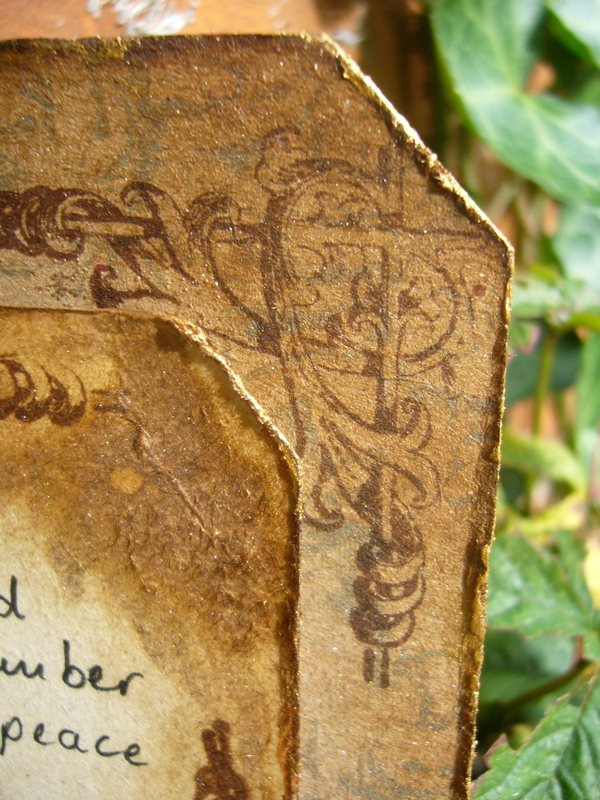 All the stamping here is done with Coffee and Sepia Archival Inks (oh, and Black for TH's Apothecary script behind). 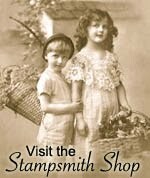 I've never been able to draw in the way I would like - and stamps offer a wonderful alternative, I think... it's like the drawing I could never do. 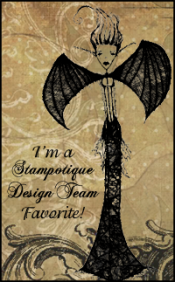 I'm so happy to have found stamping as a pastime - it feels like coming home. And one of the things I adore most about discovering Distress Inks is the capability it gives me to create things that seem to be full of history and character, having travelled through time, and that is what I've loved playing with here. It's a simple piece, but I love it... I'd love to know what you think too. I'm very glad you found time to drop in today, and I look forward to seeing you again soon - either here, or elsewhere in Craftyblogland. In fields and forests, all their powers I know. She led a peaceful, innocent life, with her green herbs for companions; she associated little with the people around, except in a business way. They came to see her, but she rarely entered their houses. Every room in her house was festooned with herbs; she knew every kind that grew in the New England woods, and hunted them out in their season and brought them home. She was a simple sweet soul, with none of the morbid melancholy of her parents about her. She loved her work, and the greenwood things were to her as friends, and the healing qualities of sarsaparilla and thoroughwort, and the sweetness of thyme and lavender, seemed to have entered into her nature, till she almost could talk with them in that way. Hello all, and a warm welcome to Words and Pictures on this chilly day (well, it's chilly where I am, you may be more fortunate). I'm getting there with catching up with the Funkie Junkie's 12 Tags of Christmas, sponsored by The Funkie Junkie Boutique, but I've skipped one - this is number 5. I'll come back to number 4 soon. So far I've taken the inspiration provided each week and run in the other direction from Christmas... and today's is no exception. 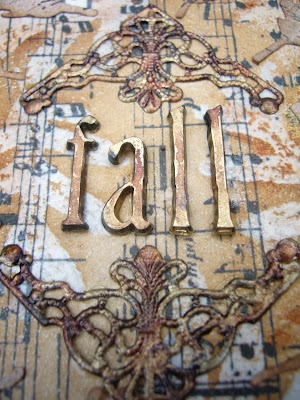 I've discovered I love autumnal crafting, and I'm jolly well hanging onto it for as long as possible! Yup... autumn leaves it is. And plenty of them, in all sorts of ways. I've taken inspiration from Linda's original in lots of ways. There's the music manuscript background; and I've done some embossing on it (leaves not snowflakes); I have a four-letter word as my focal point; I've used some metal filigree embellishments; there's script on my die-cut shapes; and the original starting colour of Vintage Photo is also the same in both tags. But the big difference, of course is that hers is Christmas and mine is Autumn. And, yes, I've used the American term "fall" because I also wanted to reference the leaves tumbling all over the tag, falling to the floor in that final burst of fiery colour before they turn to mulch (love that word!). I'm actually really pleased with the lettering here. 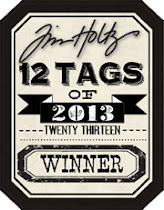 It's the Idea-ology Alpha Parts from Tim Holtz, and they start out as black plastic. I've added drops of alcohol ink in Gold and Rust until they mixed to my satisfaction. I love what a variety of looks you can achieve with these letters - I've used the same Random set a couple of times recently with slightly different recipes, and love each different result. I treated the metal filigree the same way. I got these corner pieces very cheaply on ebay, but they've got a bright white enamel finish, so that had to be changed! Again, I added various alcohol ink drops (think black was in there somewhere with these too) until I liked the look. I love the variegated autumnal shades I've ended up with. 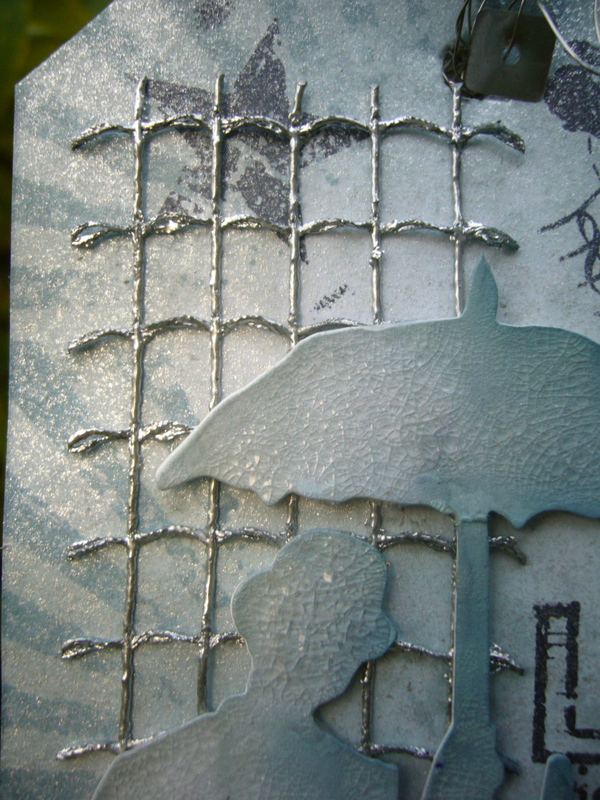 After embossing, I went over the whole background with Tea Dye, Vintage Photo and - towards the edges - Gathered Twigs. 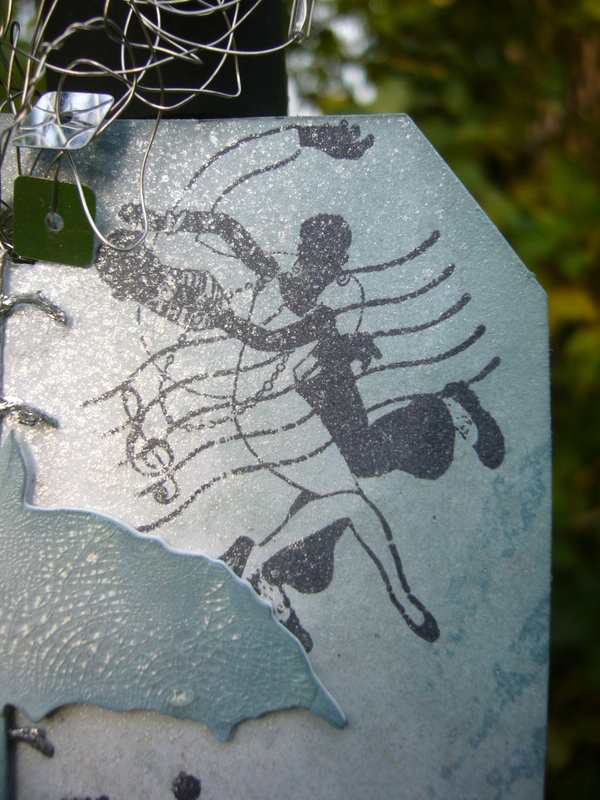 And near the end of the making I stippled on some Transparent Iron Oxide paint to fire up the colours overall. The edging was done with Gold acrylic paint, dabbed on with a crumpled piece of paper towel to get the texture on it. It was slightly too bright a gold, so that got a blending of Gathered Twigs over it as well, and a touch of the Iron Oxide right at the edges. 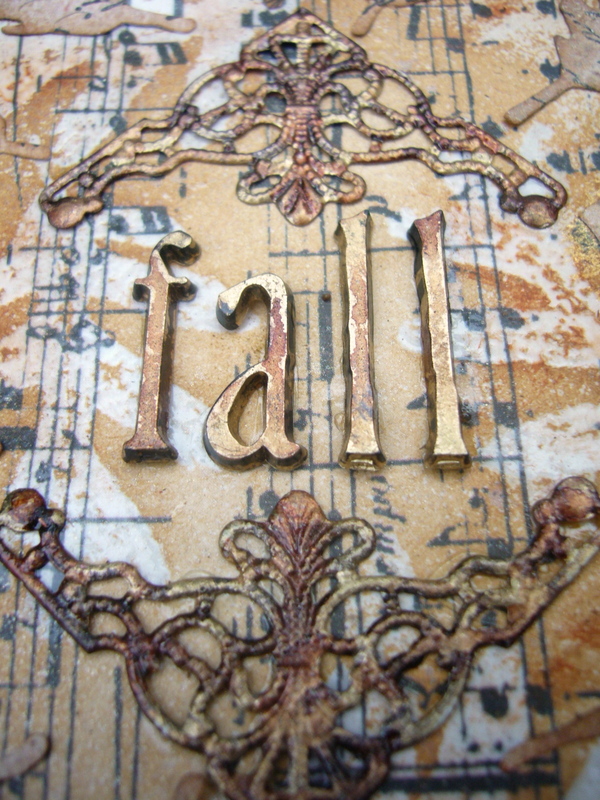 For the leaves, I stamped a script stamp onto some light brown cardstock, and ran it through the BigShot with the TH Autumn Gatherings die. So music in the background and words in the leaves - combining my favourite things again with my new favourite thing (crafting, if you hadn't worked it out)... And words in the leaves, you see - "Every leaf speaks..."
The string at the top is from a big ball of coated twine, with a brass/bronzey metallic sheen. I can't remember now where I picked it up, but it cost peanuts and there's loads of it, so expect to see more of that! So that's number 5... I've got 4 and 6 to go, and then I'll be up to date. What's the betting I can get it done before number 7 tips up on Monday?! Thanks so much for stopping by today... and why do come and play along. 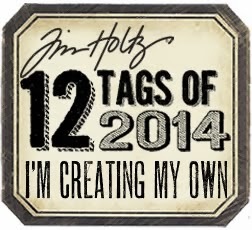 Linda's tags are so amazing, and kick off so many ideas and possibilities. And you don't have to play every single one (though I think you need the full set to be in the running for the prize), and you've got until 17th December to get it done - piece of cake!! Artful Times would like to see Orange, Brown and White (there's just about some white left thanks to the embossed leaves! 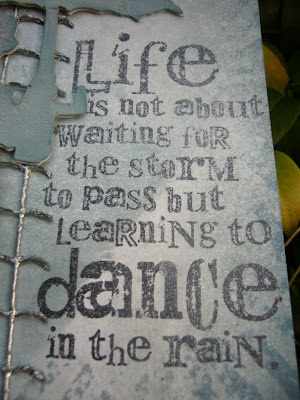 Foggy grey days, dim and grim... we'd better learn to dance in the rain, as it seems we'll be waiting a while otherwise! 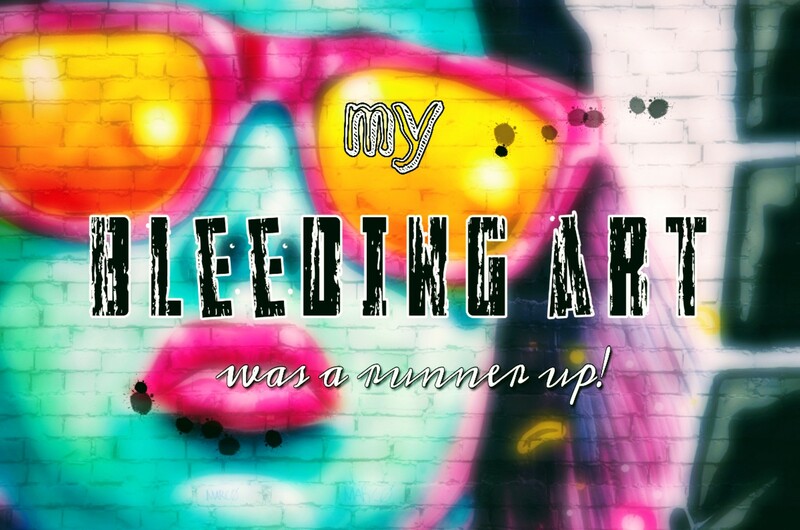 Welcome all to another collection of Words and Pictures; I'm so happy you've stopped by. 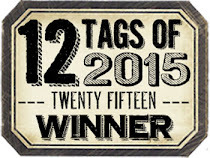 I'm catching up with the Funkie Junkie's 12 Tags of Christmas. 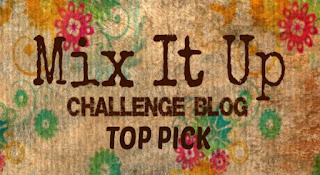 Linda Coughlin, the Funkie Junkie herself is offering up regular tags of inspiration to play along with - find all the details here. And since you have until 17th December, there's still plenty of time to play along. If you manage all 12, there are prizes sponsored by The Funkie Junkie Boutique. I've got as far as number 3 so far, and here it is. It's based quite closely on Linda's original, but - since I'm still holding out against Christmas crafting (it won't be long now, I can feel myself slipping), I've dived off in a slightly different direction again! I absolutely loved the mirror-like quality Linda achieved with her main ingredients of Weathered Wood and Pewter Metallic Distress Stain. He got a good dollop of Rock Candy Crackle paint smeared over him, and I left him to get on with cracking up. Once Umbrella Man is there, it's pretty much a foregone conclusion that I'm going to end up with maybe my favourite of all the TH quote stamps - it just seems to me a match made in heaven. 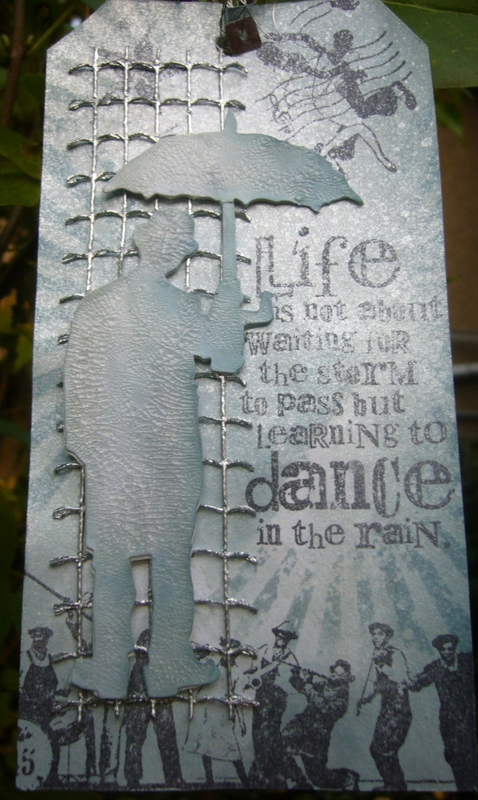 And with that notion of dancing came the chance to try out some Graphic 45 stamps I got at a bargain price on ebay. I love the movement of this couple... you can feel the swing of the hips as they go. And the stamp along the bottom with the musicians is just fabulous - full of musical verve. I love how the fiddler to the right seems to be gazing up at giant umbrella man, willing him to join in the dance! 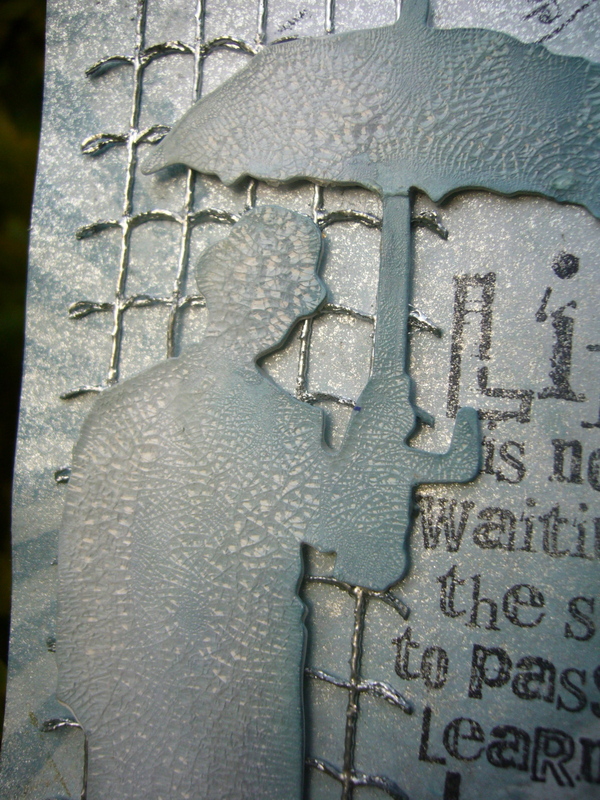 I didn't have any broad metal mesh, so I took some plastic mesh ribbon and embossed it with silver embossing powder - pretty pleased with the result, and it allows Umbrella Man to stand proud of the action in the background. It still needed something else though, and with the TH rays die, I found out what it was - what a great stamp for focussing attention into the heart of the piece. And, as with yesterday's tag, there is a little nod to Christmas in the trimmings at the top... perhaps I'm starting to slide down that slippery slope to Christmas crafting after all! So that's me for tag three... Such fun to take off from Linda's inspirational work and see what arrives - had no idea where this one would go, but I really like where it's arrived at. And music again, you see... I just can't get away from it at the moment - but then, who'd want to?! Thank you so much for taking the time to have a look - it's such a delight to share this journey with others, and your support and feedback is so much appreciated. See you again soon - probably with another Funkie Junkie tag at this rate...! 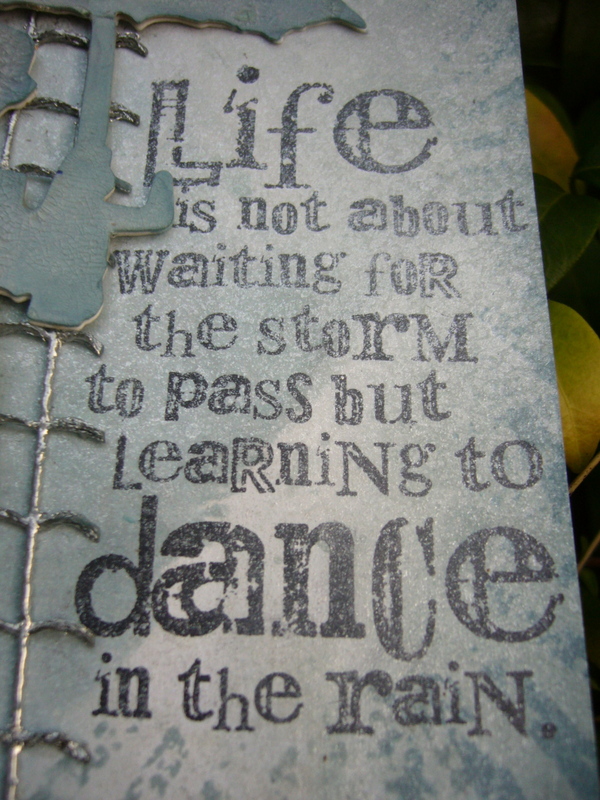 Dancing: the vertical expression of a horizontal desire legalised by music. Hello... yup, me again. If you're back for a second visit (having already seen What's On My Workdesk this Wednesday), then you're doubly welcome, but it's great to see you even if it's your first time today, or indeed ever! I said this morning that I needed to do some catching up with the 12 Tags of Christmas being offered up by the amazing Funkie Junkie a.k.a. Linda Coughlin. 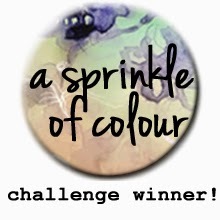 The challenge is sponsored by The Funkie Junkie Boutique. 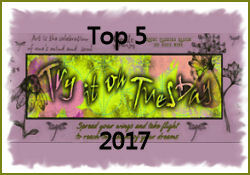 Linda's offering weekly inspiration between now and (nearly) Christmas, and you can play along in whatever order and whenever suits you, as long as you get all 12 done by 17th December. Here are all the details - and don't worry that you're behind... so am I!! Linda's on number 6... this here's my second! 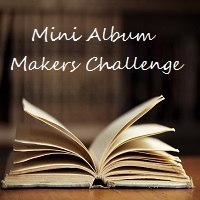 This is an Inspiration Challenge - so one of the great things is that you can spin off from Linda's tag in any direction, as long as you let her know what it is in her work that's kicked you off. 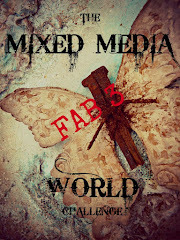 So my tag has taken inspiration from Linda's original in terms of the background and gears, but taken them elsewhere. And I'll make no bones about it, this was another experiment for me (I was waffling on about experiments this morning) - and a slightly reluctant one at that. 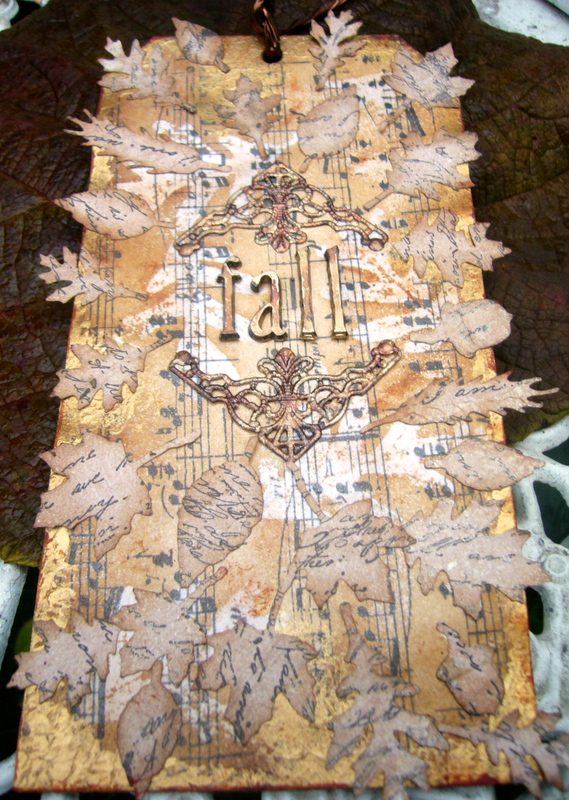 I didn't do the faux riveted metal technique when Tim Holtz had it on his September tag; I didn't do it in the Studio L3's Compendium of Curiosities II week. 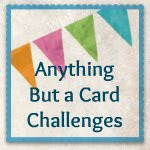 It didn't really seem like my thing, but I've seen it look great at lots of my favourite blogs (like here at the fabulous Inkypinkycraft), so I thought it was about time I gave it a whirl. And you know what, in the end I had a lot of fun with it! I didn't have the adhesive metal tape, but used some metal paper from PaperArtsy and some glue instead. 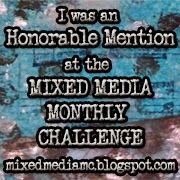 And, being me, I went with blue tones on the background, and on my gears. 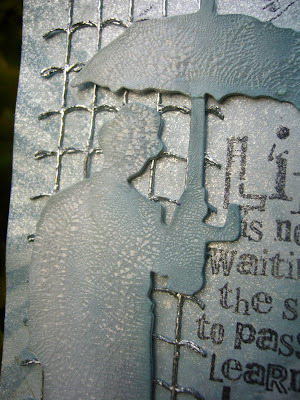 The gears are cut and embossed using Spellbinders' Sprightly Sprockets dies. The ones at the bottom are cut out of black card, and treated to another TH technique using Perfect Pearls Mist which I've used before, and really loved. I was going to trim them to the tag edges, so that it would look like an On the Edge die, as Linda's used (though hers were snowflakes), but I decided I liked the circles sticking out. The gears in the middle are cut out of an old Diet Coke tin (you can still see some red text if you look closely at the edges! ), and given lots of lovely alcohol inks to drink. Okay, and a slight concession to Christmas in the trimmings, I admit it! The letters are cream cardstock - cut with a TH decorative strip die - with an edging of Chipped Sapphire, and then lots of Perfect Pearls Mist in Pearl and Pewter. And the sentiment is pretty clear I think, both in close-up and the wider frame... 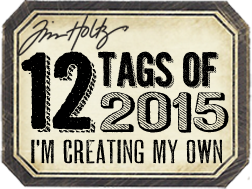 I'm on tag number 2 out of 12, and I'm on an incredible journey with this crafting lark! It's all Work In Progress. Thanks so much for joining me for part of the journey, and I hope to see you again soon, either here or elsewhere in Craftyblogland.